Odds are you’ve felt down in the dumps from time to time, and perhaps you turned to one of those Chicken Soup for the Soul books — you know, those feel-good collections of inspirational true stories about mothers, fathers, teenagers, veterans, and lots of other demographics. Well, we happened to read Chicken Soup for the Soul Entertainment Inc.’s financial statements this week, and boy, those folks are probably feeling pretty good this year too. First we noticed Chicken Soup’s stunning increase in net income, from $781,000 in 2016 to $22.8 million last year. Revenue, however, only rose from $8.12 million to $11 million — a jump of 35 percent, which is good, but nowhere near to explaining the gigantic spike in profit. So we started looking through the income statement, captured below. The reason is about three-quarters of the page down. Do you see it? A one-time “gain on bargain purchase” of $24.3 million. A bargain purchase, indeed. We had to know more, So we flew over to the Interactive Disclosure page and looked up what Chicken Soup had to say under the Business Combinations item. We found that in November 2017, Chicken Soup acquired a company called Screen Media for $5.3 million. Screen Media is the operator of PopcornFlix.com, a video-on-demand website that fits within Chicken Soup’s broader media empire. Currently offering Breakfast at Tiffany’s, Braveheart, and Death Bed: The Bed That Eats, among other titles. To each their own. Apparently Screen Media was in debt up to its film reels. The company is privately held, so we don’t know how much debt — but enough debt that its lenders simply wanted the owners to sell the business, which was limping along with falling revenue and operating losses anyway. Under the income-based approach, the third-party appraiser calculated the net present value (“NPV”) of after-tax cash flows as expected from the film library and from Popcornflix. The NPV was added to a terminal or exit value for these assets to obtain estimates of fair value. Based on the fair value of the net assets acquired, the acquisition of Screen Media resulted in a gain on bargain purchase of $24.3 million. Screen Media, in recent years, had been heavily indebted and their lenders allowed it to seek an acquirer who would pay an agreed-upon amount to such lenders, who were willing to accept a significant reduction in the total indebtedness due. This allowed the Company to acquire Screen Media on a debt-free basis at a significant discount. 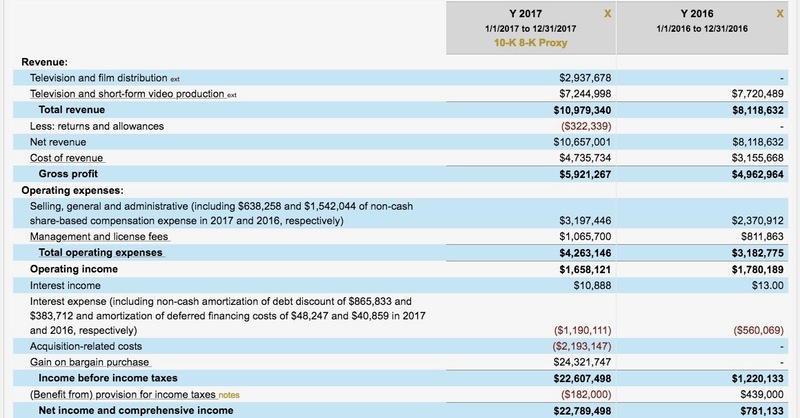 So Chicken Soup essentially acquired the business debt free, and turned a $5.3 million purchase into a one-time gain on the income statement of $24.3 million. Call it Chicken Soup for the Financial Analyst’s Soul — and you can unravel mysteries just like it, easily and clearly, through Calcbench.